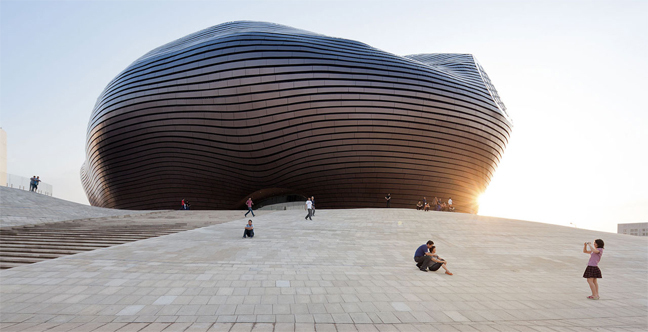 Ordos Museum is located in the new city centre of Ordos. Driven by a booming economy, the Municipal Government of Ordos were determined to create a new city, dozens of kilometers away from the current city, on a site that until recently was nothing but the Gobi Desert. The urban masterplan drew on a symbolic image of “The ever rising sun on the grassland”: a rigid and precise series of urban landscapes radiating from a central plaza. Chairman Mao once said: ‘only on a clean sheet of paper can the newest and most beautiful picture be drawn. On a tabular rasa, where the future holds great uncertainty, it is quite dangerous to design a building for the city center, where the urban grid is inferior and still exist only as a pattern due to its urban prematurity. The Ordos Museum needed a protective cover, where the interior is protected from the ‘city’. 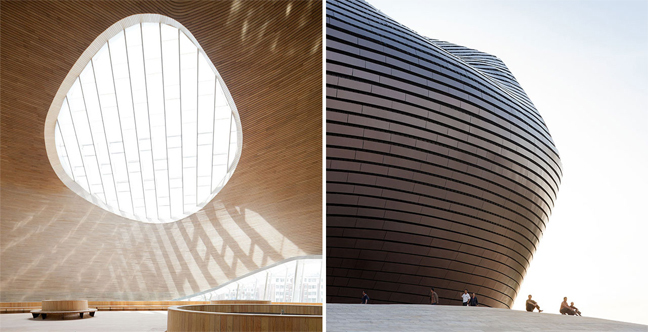 Inspired by Fuller’s Manhattan Dome, the Ordos Museum was designed to be the new irregular nucleus for the new town, to encourage the history and culture of Ordos to extend further into the future. The design of the museum was conceived as a reaction to this city plan. It takes the form of a natural, irregular nucleus in contrast with the strict geometry of the masterplan. The structure is enveloped in polished metal louvers to reflect and dissolve the planned surroundings. This shell will enclose a new interior, forming new public space for the people to come. 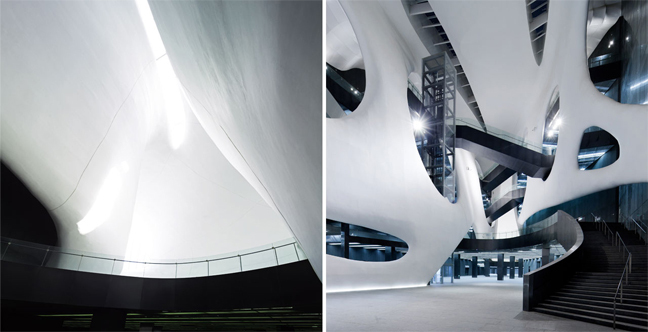 The interior is divided into several exhibition halls, defined by continuous curvilinear walls, all opening open onto the shared public space that runs through the museum. The glazed roof will draw light into this environment, which is then channeled through the building by the luminescent walls, whilst the louvers will allow natural ventilation. The bright, tranquil and fluid environment of this new space will offer visitors with designed environments for them to experience their culture and the space under the sun. Location: Ordos, China. Site Area: 27,760 sqm. Building Area: 41, 227 sqm. Building Height: 40 m.
MAD works in forward-looking environments developing futuristic architecture based on a contemporary interpretation of the eastern spirit of nature. All of MAD‘s projects – from residential complexes or offices to cultural centres – desire to protect a sense of community and orientation toward nature, offering people the freedom to develop their own experience. Founded in 2004 by Ma Yansong, the office first earned worldwide attention in 2006 by winning an international competition to design a residential tower near Toronto, expected to be completed in the end of 2012. MAD has been commissioned by clients of all backgrounds, leading to an intriguing combination of diverse project designs. MAD’s ongoing projects include two major cultural projects in Harbin: the China Wood Sculpture Museum and Harbin Culture Island, an opera house and cultural center that will retain the original wetlands as an urban park between the old and new city. 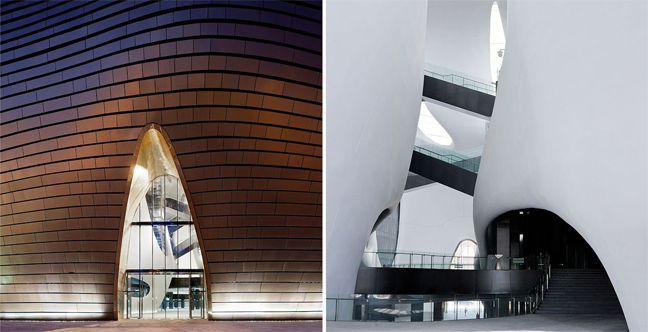 In 2011 MAD completed their first museum in Ordos, Inner Mongolia. It is a futuristic shell that protects the cultural history of the region and refutes the rational new city outside. MAD is led by Ma Yansong, Dang Qun and Yosuke Hayano. They have been awarded the Young Architecture Award from the New York Institute of Architects in 2006 and the 2011 RIBA international fellowship.